Something that's come along in the last few years is 3d printing, or 'rapid prototyping' - basically instead of having to make a mould and injection mould plastic, you can now design an item on a CAD program and just 'print it out', something that only a few years back we'd have been calling science-fiction! 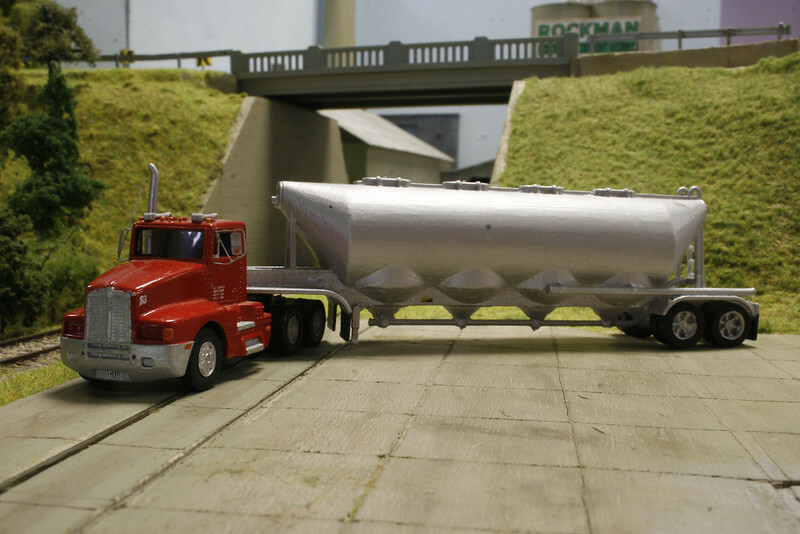 I ended up in contact with a chap called Barry Clements a couple of months back, and he's started designing HO scale trailers, something that's not been available now is a 'dry bulk' trailer, suitable for transloading loads such as plastic pellets, and that was something I thought I could use. https://www.shapeways.com/designer/baztrains should take you to his range. https://www.shapeways.com/model/1106980 ... -tank.html - and around 10 working days later it had been printed off at Shapeways plant in Holland and shipped over by UPS. Firstly, this isn't a cheap (for the consumer) way of purchasing one of these. You aren't likely to see folk creating their own models of things already available commercially for instance! If anyone produced a simple injection moulded kit of one of these it would likely cost about £20 - but they key thing there is the phrase 'if anyone produced a simple injection moulded kit' - with simple tooling for plastic kits having the potential to cost their developers more than £10k in tooling before you even produce one kit then their developer either needs to add on a lot of money to their kit to reclaim their investment or be very confident that he is going to sell thousands. This method allows a hobbyist to create a model 'for free' in the comfort of his own home, print one out (and pay for that), and then if he is the only person that ever wants one he doesn't have a huge sunk cost. That said, don't get me wrong, it's not exactly un-detailed. These 'undec' shots are straight from the packet. 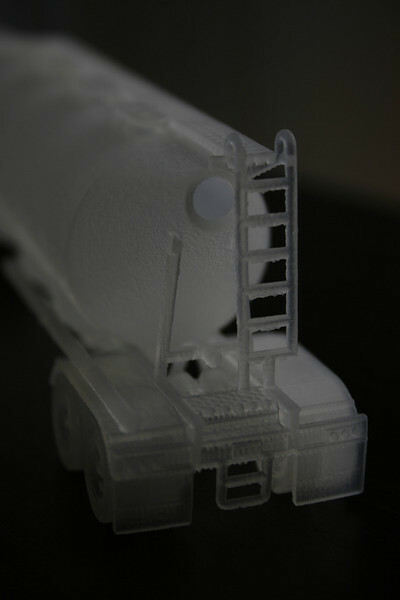 The fascinating thing if you're used to injection moulded (or even resin) kits is that this is not 'after assembly' - it's printed like this in one piece, all those overhangs and voids, walkways and steps with holes, believe it or not even movable wheels!, are constructed in one piece. That's kinda remarkable and very different when you've never seen this tech before like I hadn't. The only 'assembly' is the two 'discs' on the discharge pipe which form the ends of the silo's, I think that's so the hollow tank doesn't distort as the plastic sets. I guess that makes it a 'kit' - but only just! One thing that may be noticeable in those is that it does require a little cleaning up, there's a combination of 3 things to keep an eye on, none of them are 'show stoppers', none of them are hard to deal with. You'll probably notice on the side-on shot above there is a rough finish, obvious on the discharge pipe, that's not 'flash', apparently it's supported in a waxy substance (i'd liken it to damp sugar) whilst being constructed and that is the residue, it scrubs off with the help of some warm water. Because it's constructed in layers the round tank does have minor 'striation' marks on it, you can see some in the side-on image, a quick pass with a file removes these. In addition the surface itself can be slightly rough in places, and whilst in some places that's easy to run a file over (like the sides of the tank) - others it's less easy - I put in a couple of hours of cleaning up before painting, but didn't go over the top, I suspect most folk could do better than I did. So there we have it, my first dabble with 3d printing. 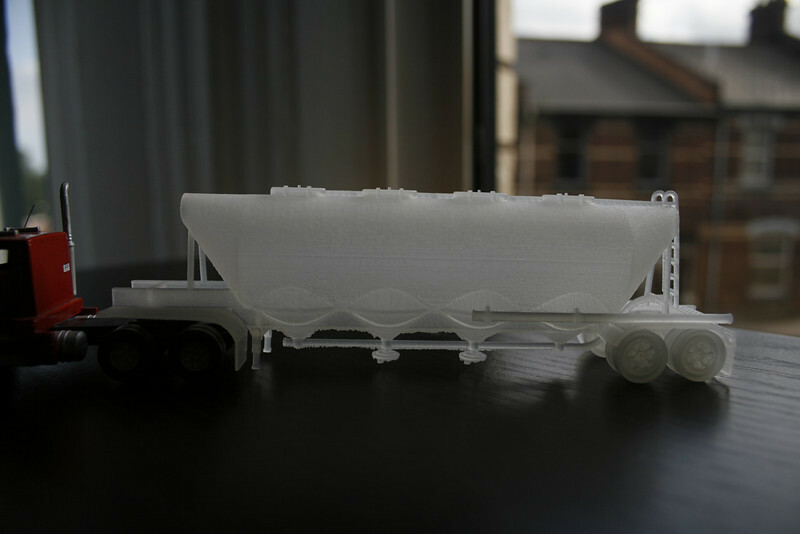 Whilst in N it's being used to produce rolling stock, for example here's a shell for a Metra 'winnebago' to retrofit on the Kato F40 chassis: https://www.shapeways.com/model/682473/ ... erialId=61 - I don't see that being affordable for HO scale. Now can someone produce the drawing files for the SDL39 sideframes for 3D-printing?